The temptation is real. You haven’t eaten lunch yet, and your stomach is grumbling. 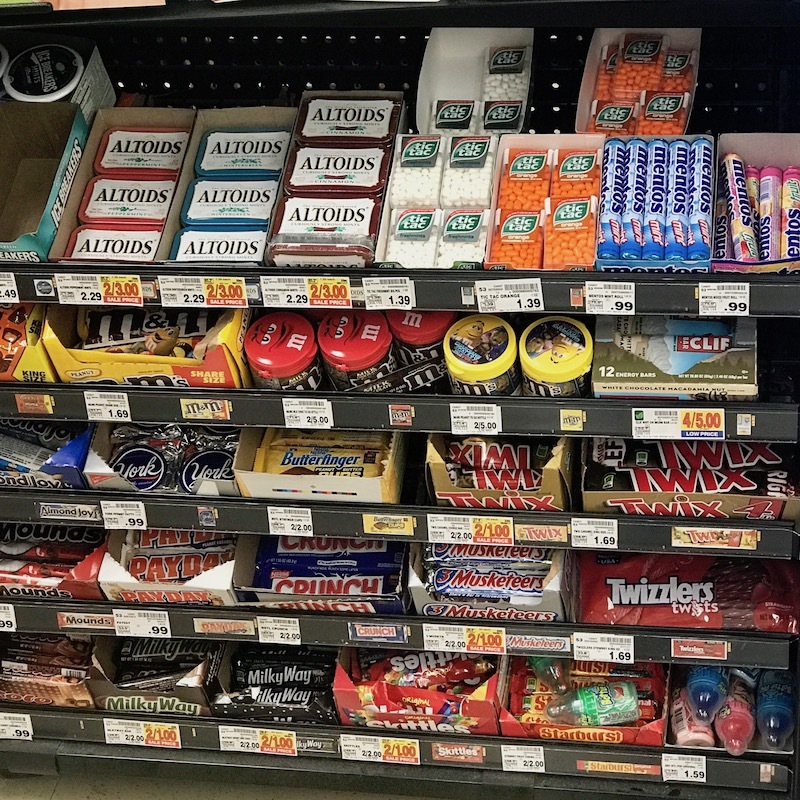 Finally, you make the decision: I’ll just grab one last candy bar…I’ll start my diet tomorrow. Don’t feel bad. We have all done it. 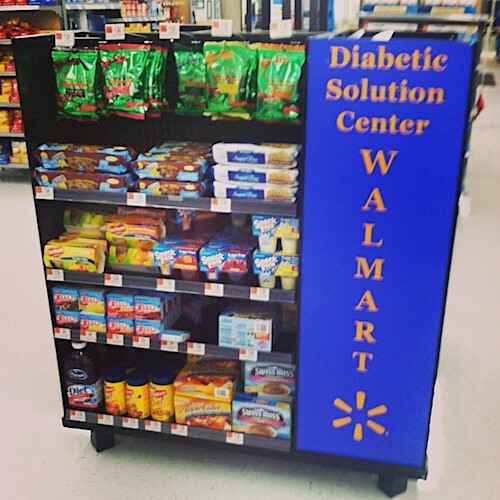 The precise placement of candy and high sugar items at the checkout line is no coincidence. Big food marketers place it here because of a concept called decision fatigue.Essentially, research shows that your willpower will steadily decline with each decision you ask your brain to make. Think of it like this: if you saw a shelf of candy at the front door when you first walked in, you’d be a lot less likely to grab one, wouldn’t you? But after you make a bunch of decision throughout the grocery store, your willpower is significantly lower during time of check-out. I know, I know – those sneaky marketing snakes! Decision fatigue leaves you vulnerable to marketers who strategically plan and time their product placement. Todd Heatherton, a social neuroscientist, studied the effect of low blood sugar, on decision fatigue. 1. In order to not eat, you need willpower. 2. To have willpower, you need to eat. Does this mean we should go around drinking orange juice or eating fruit all day to stop our sugar cravings? Not quite. Spikes of glucose (the form of sugar in our blood) from quick energy sources (like sweets, or even natural sugars) may prevent a LOW blood sugar, but does not help the brain with the long-term blood sugar balance. How does what we eat affect our sugar cravings? Let me explain a little more. There are three macronutrients in food: carbohydrates, protein, and fat. They each serve an important purpose to a healthy diet, but our body uses them all differently. When we eat carbohydrates, our blood sugar naturally increases, and our body releases a hormone called insulin. The insulin helps lower our blood sugar back to normal. When protein and fat are added to a carbohydrate meal or snack, our body’s insulin response will improve. Essentially, protein and fat HELPS your body maintain a more normalized blood sugar level. Picture a tall mountain peak. When we eat a snack only containing a carbohydrate (like chips, crackers, or fruit), our blood sugar spikes like a mountain top. As we all know: what goes up, must come down. Just as quickly as our blood sugar spikes, we also see a quick drop in our blood sugar (when insulin is doing its job). This leaves our body feeling like we need a quick source of energy, yet again. Now picture a steady hike up a small hill. When we include a healthy protein or fat WITH our carbohydrate snack, it limits the dramatic roller coaster effect of our blood sugar. Instead, it naturally creates a slow rise, but returns to a more comfortable level. It can also help carry us, feeling satisfied and curbing our sugar craving, to the next nutritious meal. This, my friends, is the basis of healthy snack pairing – a key element for curbing sugar cravings. We are trained in America to believe that low-fat or sugar-free = healthy. I was once victim to this marketing as well. Maybe just like you, I once thought “if I have the sugar-free cookie, then i’ll curb my sugar craving without actually eating sugar!”. Thankfully, many people are now understanding that this is not the case. I was once victim to the low-calorie, low-fat snack trap. I would grab a granola bar, a 100-calorie bag of crackers, or just carrot sticks, thinking this was a good, sustainable snack for me. One to two hours later, I had a grumbling stomach and was feeling, dare I say, hangry. *Cue snacking overload when I got home. * After about a year of working as a dietitian, I started pairing my snacks (example: fruit with some type of low-fat cheese). However, I would still have pretty strong sugar cravings when I got home from work! I would think, what’s wrong with me? 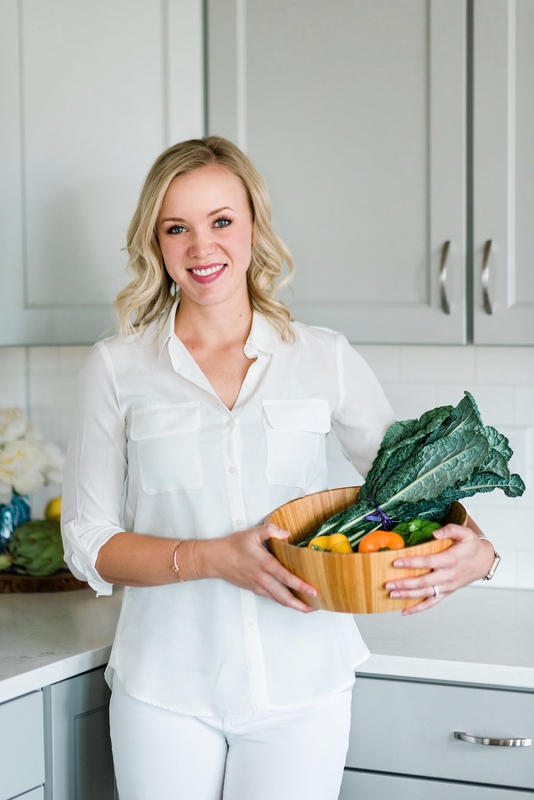 Here I am, a Registered Dietitian, trying to help people get a better grasp of their eating habits, when I felt a little out of control with my own. When I finally ditched the low-fat trap, and started including wholesome (i.e. 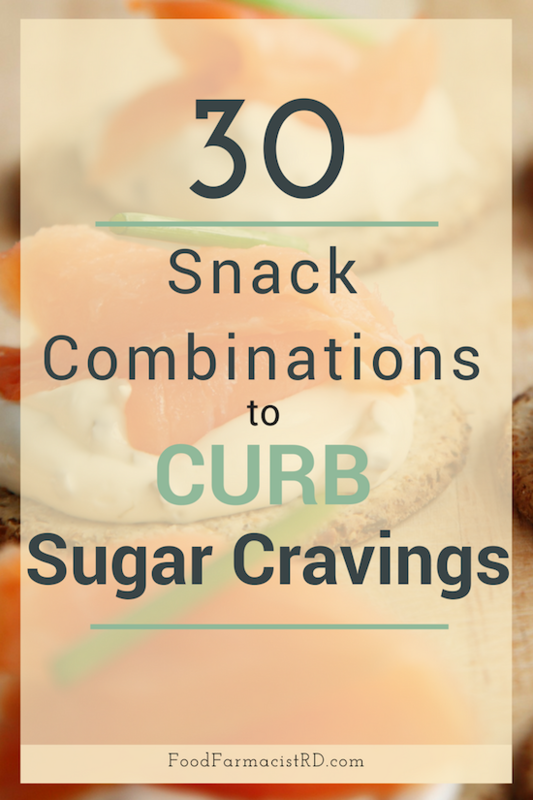 back to basics) paired snacks, I finally found a sense of self-control with my sugar cravings. 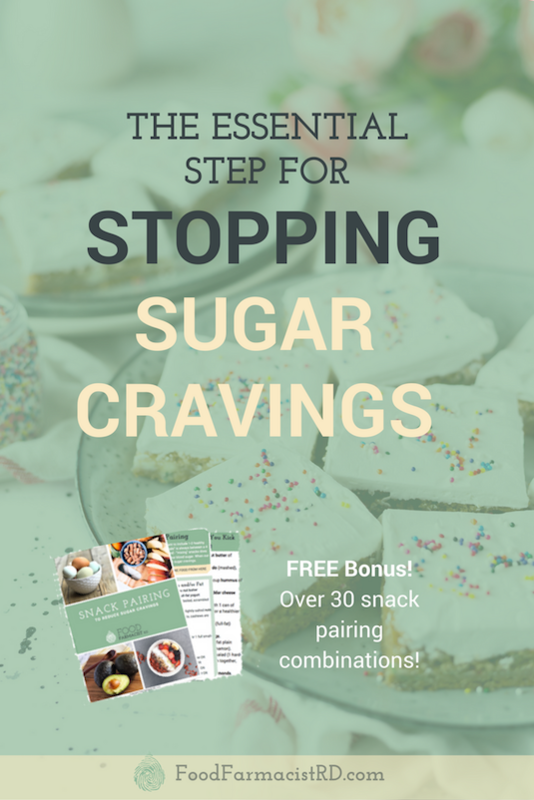 I want you to feel in control of your sugar cravings too. Here are some tips to get you started. 1. Do not be afraid of fat. Fat has gotten a bad rap in the last 30 years. Unfortunately, since the revolution of “low-fat” in the 1970’s, sugar intake has increased nearly 30 percent. 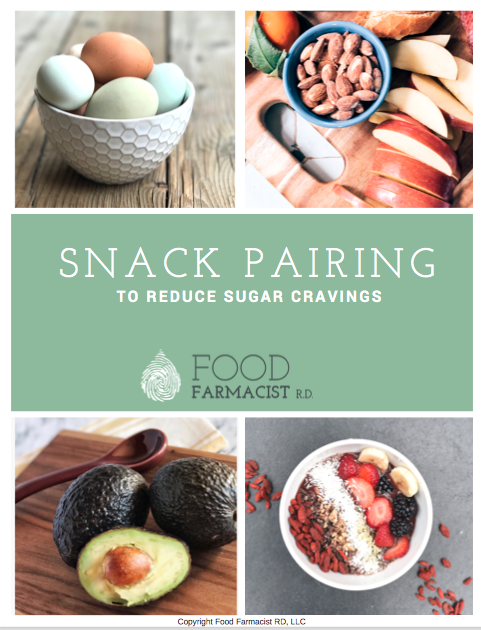 Using a healthy, real food source of fat in your snack pairing is an excellent way to reduce sugar cravings and aide in weight loss. For example, many studies, like this one, show that regular avocado eaters have a lower weight, small waist circumference, and better cholesterol numbers than non-avocado eaters. This is likely due to the increased sense of fullness (i.e. satiety) that fat provides when in comparison with the other food groups. Fat can also reduce the sugar craving hormone called ghrelin for longer periods of time than carbohydrate foods (meaning you can go longer without feeling hungry again). Adding a healthy fat source to your snack can also aide absorption of vital nutrients like carotenoids, and fat-soluble vitamins like A, D, E, and K. Pair your apple with 1-2 tablespoons of a good, natural nut butter (peanut, almond, cashew etc. ), use 1/2 smashed avocado for dipping your carrots or snap peas, or grab a piece of full-fat string cheese to go with your fresh fruit. 2. Listen to your inner hunger scale. Think about your appetite in a scale from 1 to 10. Number 10 is Thanksgiving stuffed, super uncomfortable, food coma. Number 1 is “I’m-going-to-eat-my-arm-off-starving”. It is best to stay between a 4 and 7 at all times. Listening to your inner scale can prevent you from dipping into the dangerously low 1 to 3 scale, when we are more tempted to reach for the high sugar snack item. Planning your snacks for the week before you go to the grocery store can help you succeed. Pick 1-2 protein and fat sources, and 1-2 carb/fiber sources to ensure you pack at least 2 snacks throughout each day at work. If you eat a late breakfast, you may be able to get away with just one snack between lunch and dinner. Remember the decision fatigue concept from earlier? Well, this is one of the main reasons why we are more prone to sugar cravings around 5pm or later! Make sure to PLAN your snacks, so you avoid having to even make that decision. If you know you start craving sweets when you get home from the office, plan a paired snack around an hour before you leave work. I still have the occasional sugar craving, just like everyone else. In our world laden with food marketing, it is something we will have to deal with throughout our lives. 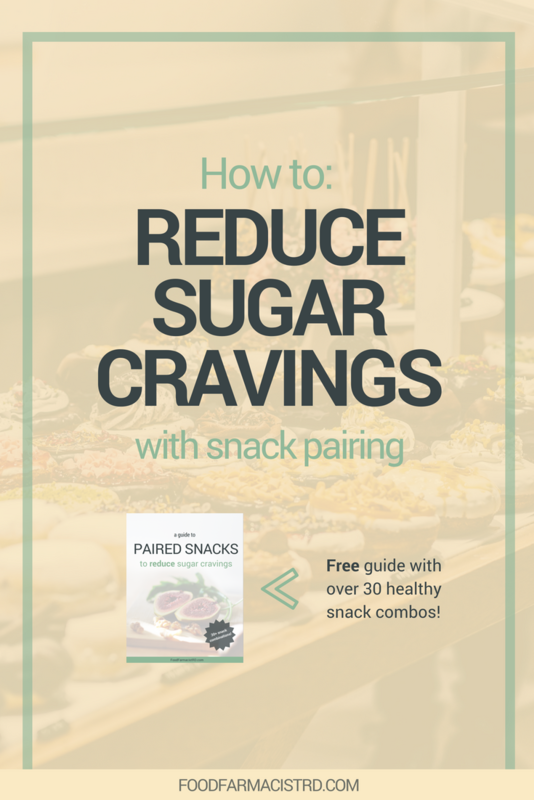 Snack pairing, along with an otherwise balanced diet, can help reduce the frequency or quantity of these indulgences and sugar cravings. As a reminder, here are the tools that we discussed above to stop your sugar cravings. Include 2 healthy paired snacks in your day: 1 carbohydrate source + 1 protein/fat source with EACH snack. Include healthy fats (or wholesome calories) like those found in avocados, nuts, or cheese. Focus on real food ingredients (less ingredients is better). Maintain your inner hunger scale between a 4 and a 7. Never allow yourself to get too hungry (3 or below), as this will make your sugar cravings a lot harder to manage. PLAN, PLAN, PLAN! Write our your paired snacks for the week and include these ingredients in your grocery list. Take the snacks to work, school, or events with you so you are LESS likely to indulge in a “quick fix”. So, get to plannin’ and pairin’, my friends!